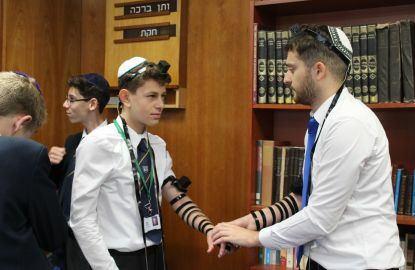 Yom Ha’atzmaut celebrations were vibrant at Kantor King Solomon, with a number of interactive programmes and workshops taking place throughout the day. All years welcomed Yom Ha’Atzmaut assemblies delivered by a number of our year 7 and 9 pupils, along with our Head Boy and Girl, who spoke about Israel’s history and achievements since Independence 70 years ago. Year 7, 9, and 10 were treated to some fantastic activities led by a number of Israeli students from our partner school in Israel, whilst year 8 enjoyed a special drum workshop. Israeli themed food and music filled our lunchtimes whilst this year’s edition of our annual year 7 balloon release concluded a wonderful day. In the evening, some of our year 7 and 9 pupils delivered their presentation at the Gala Show at Redbridge JCC.